The probably most exceptional networking event in Berlin is taking place for the third time: Again, the equity-based crowdfunding platform Companisto and the German first-league basketball team ALBA BERLIN are inviting the start-up scene to attend the Startup Crunch Time at o2 World Berlin! On 26 March, 30 founders (people at the management level) will have the unique opportunity to meet one of the most important company founders and investors in Germany: Stephan Uhrenbacher. During his eventful career, Uhrenbacher has experienced various aspects of entrepreneurship himself: He served as the director of product at bild.de, supervised the Northern Europe Region of lastminute.com, and founded Qype – a portal for recommending shops and locations – in 2005. After Qype, he founded the online platform 9flats, on which users may offer their private houses, rooms, or sleeping accommodations for rent and book such accommodations online. Moreover, he founded "Avocado Store," which specializes in selling sustainable products. Most recently, Uhrenbacher pooled his activities as an incubator and angel investor in Density Ventures, a company that has announced a new airport app called Flio. 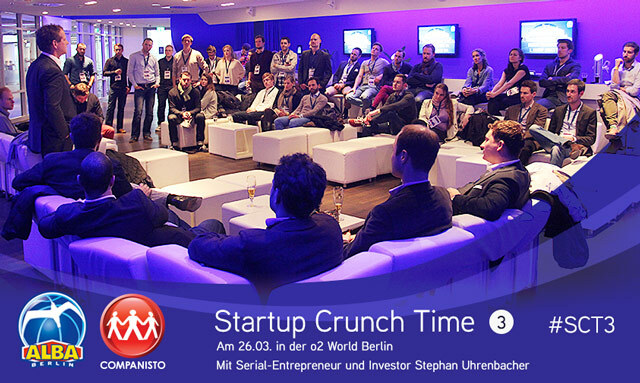 On 26 March 2015 from 5 p.m. onward, 30 select founders from the start-up scene will have the exclusive opportunity to participate in a discussion with Stephan Uhrenbacher in the VIP lounge of the o2 World Berlin and to benefit from his expertise and his considerable experience. This discussion will be followed by a group picture on the court with Stephan Uhrenbacher, a networking dinner with interesting founders, and the basketball highlight ALBA BERLIN vs. Red Star Belgrade (which can be watched from the VIP lounge). Attendance is free for founders and managing directors. Applications will be accepted until 16 March 2015.